Providing structure and a routine of exercise for your dog goes a long way. One thing to note is that dogs do not often entertain themselves. For example, your dog barking can simply be out of boredom. If you have a dog that is misbehaving, one reason can be due to an over abundance of energy and not enough outlets for that energy. This is all the more reason to take your dog on routine daily walks. This will provide them with an activity they love, a time to bond with your dog, and a great way for them to release all that built up energy. Your dog knows when it’s time to go on a walk. Most likely they’re all over you when they see you grab their leash. So it’s important to understand just how important a walk is to them. It’s a great time for them to get out and explore and expend some of that curious energy, but make sure they know the rules. Before you go out consider having a routine with your dog. You can relay various commands to them as you and your dog get ready, such as having your dog “stay” while you calmly put their leash on. Providing a calm environment before you go on the walk will help reinforce good behavior on the walk. Make sure to also reward your dog for good behavior so they know they’re doing something right. 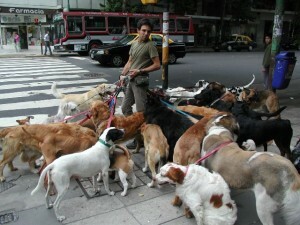 A common problem many dog owners experience is their dog actually walking them and not the other way around. Your dog will naturally be excited by the big wide world, but that doesn’t mean they should have the freedom to pull you around your neighborhood. When you walk your dog make sure they are either beside you or behind you; this helps to reinforce your relationship and establishing you in the clear role of leader. While your dog will enjoy their walk it should not be looked at as a time for overexcitement and play. Your dog should understand that a walk is a calm activity. You can help to reaffirm this environment for your dog in various ways. If you find your dog is running ahead of you or becoming over excited, stop your walk, calm your dog down and wait patiently until they’re ready to continue. When you start walking again make it a casual movement so as not to pull your dog out of their calm state. If you work during the day and your dog is left home by themselves, you should walk your dog before leaving for work. This will put your dog in a “rest” state and help to curb destructive behaviors while you are gone. You should also walk your dog when you get home as they’ll be ready to go again by this time. Dogs of all breeds can benefit from daily walks with their owners. By positioning yourself in the leadership role and giving your dog a daily exercise like walking, your dog will be less likely to be destructive, have separation anxiety, and have other behavior issues. Daily walking will help ensure both you and your dog are healthy and happy.